The quite grand building which today comprises Nos 80, 80a and 80b High Street was built by Joseph Berry Edwards as Southwold's first purpose-built bank, a fact which is remembered in the name of the passageway which runs through to Victoria Street on its left hand side - 'Bank Alley'. James Maggs records that the first brick was laid by Mr Edwards on July 24 1832 and the second laid by Maggs himself. By the 1st July the following year it was ready for business. It is believed that the bank in question was Harveys & Hudsons, a Norwich-based bank, owned by the Norwich Crown Bank with agencies throughout Norfolk and Suffolk. 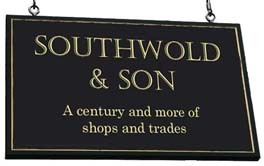 Joseph Edwards was widowed in 1841 but married the Vicar of Reydon's daughter (his deceased wife's sister-in-law) the following year and the couple moved to Harveys & Hudsons Saxmundham Branch that same year. 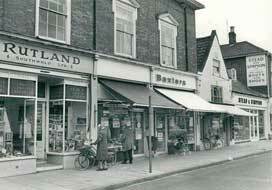 The Southwold bank agency was taken over by Mr T W Thompson, a town Bailiff. However, it seems to have closed soon after. and the building began a new life as the home and practice of a succession of surgeons. The first of these was Mr Miles Willis Rudland, who arrived in 1843 and whose surname is reflected in the current name: 'Rutland House'. Rudland's affairs were soon in trouble, however, and Maggs records his insolvency in 1847 with rental liabilities of £274. His effects were sold and he moved to Wangford. Other surgeons followed as tenants. At some date before 1896, it became Southwold Post Office. Mr Miles Willis Rudland - Surgeon. Declared insolvent in 1847 (M) and is followed at this address by other surgeons. Eaton Womack Moore - House Agent and Auctioneer. (K1896). It is clear from the photograph (right) that he is also running a post office. Indeed, in the 1881 Census, Eaton Moore and his family (then in the Market Place) is described as 'Grocer, Draper, Auctioneer and Sub-postmaster). He is mayor of Southwold between 1899 and 1902. Eaton Womack Moore - The 1911 Census describes him as 'retired auctioneer' although he certainly conducts at least one charity auction during the war. Presumably his shop and postoffice activities have ceased. Eaton Womack Moore - dies in January this year. Lilian Davey and L Emerson - 'Rutland House' Children's Clothes and toys. 'Chatterton's' - Fashion. One of five UK boutiques founded by Rebecca Cargill (nee Chatterton). Unless otherwise stated, dates given do not indicate the years in which the business started or finished but those for which there is firm evidence that it was trading at this address. Sources in brackets; key at bottom of page. 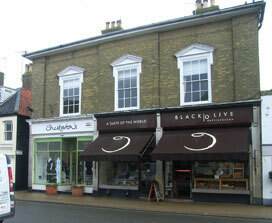 Banker's Licence, permitting Norwich Crown Bank (Harveys & Hudsons) to trade in Southwold. 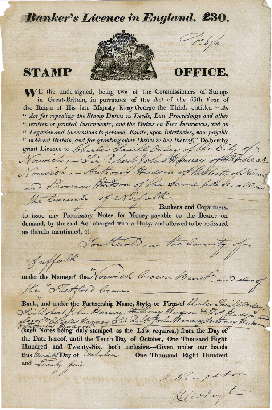 The licence, which is preserved in Southwold Museum archive, is dated 1825, eight years before opening at No 80 High Street. 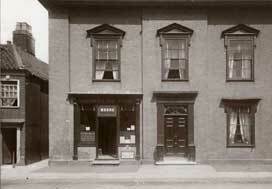 We do not yet know where (or if) the bank carried on its business in the town between 1825 and 1833. No 80 High Street probably in the final years of the 19th century. The Post Office is run by Eaton Moore and the rest of the building is his family residence. 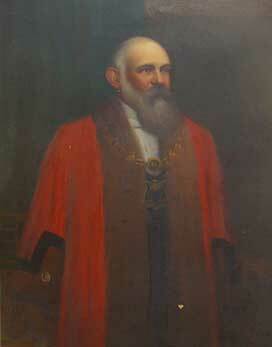 Eaton Moore painted in his formal mayoral robe and chain of office, probably in the second year of his office, 1901. Reproduced by kind permission of Danielle Knott who discovered the portrait among the possessions of her late Grandfather, a nephew of Eaton Moore. 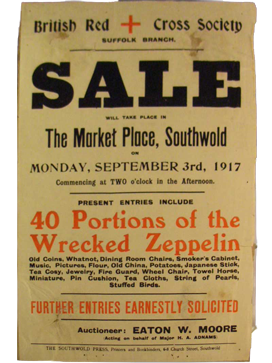 In 1917 Eaton Moore auctioned fragments of the German Zeppelin which had been brought down at Theberton. 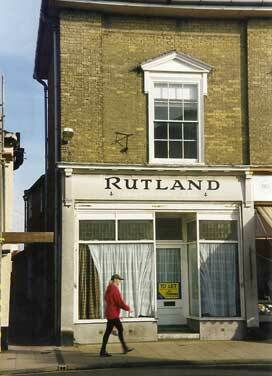 Rutland House photographed in approx 1997. well after it had closed.